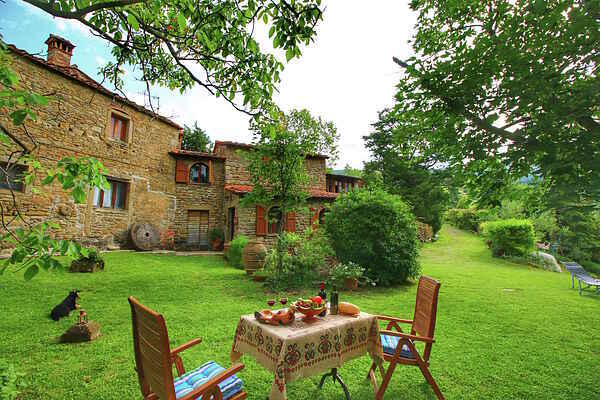 This agritourismo with 2 holiday apartments is located on a hill 480 m in elevation and 800 metres from the main road. It is fully surrounded by olive trees, vineyards and chestnut groves. The surrounding area is very quiet and relaxing and offers various options for walking in the forests and enjoying the breathtaking panoramic view. Mulino is simply furnished but comfortable apartment with its own entrance and has a view of the garden. You can also take excursions from this rural agritourismo to the coastal towns in the area, including Cortona, an Etruscan city (10 km) and Arezzo (38 km). Upon request, excursions can be organized to vineyards, olive mills where olives are pressed, or cheese makers in the area.